Are you craving some air flow in your house? Is the air conditioner running as hard as it can go but it still feels stuffy and hot in your house? Try installing a ceiling fan and see if it will give you some relief. Ceiling fans create air flow in a highly decorative way. They are many different varieties of ceiling fans these days. The choices can be overwhelming. How do you decide what kind of fan and what size you need? You first need to measure the room where the ceiling fans home will be. Your room size dictates the fan blade size. The small the room, the smaller the blade you will need on the fan. The larger the room, the larger the fan blade you need. 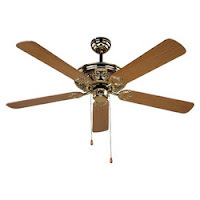 For optimum airflow, ceiling fans should be hung no higher than seven to eight feet from the floor. This measurement will dictate the kind of mount you will need to purchase for your fan. The blade pitch dictates how efficiently the fan blades move air. The steeper the pitch the more air the blades will move in your room. Are you purchasing a fan primarily for air flow or is it going to be the focal point of your room as well? If you are just going for air flow you can choose any fan that blends with your room. If you want the fan to blend with the room, you probably want to choose one of the ceiling fans that will blend in with your ceiling to avoid taking focus from your room. If you want a great focal point for your room, you are going to be excited when you go to the home improvement store and see the wonderful selection of ceiling fans that are available. There are ceiling fans for every mood you want to create. They make ceiling fans that look like bamboo fans, shells and many, many other styles. The motor housing's are available in many different materials as well. They are available in brushed steel, white, brass, bronze, copper, wood grain and other finishes. The blades come in many different shapes, as well as materials such as a metal finish, faux wood, bamboo, fabrics and many paint colors. If you live in location where you see three or four seasons a reversible fan may be right for you. In the summer your ceiling fans can be set to draw the warm air up away from you while in the winter you can reverse the fan blade direction to push the warm air that collects near the ceiling down to where you are. Did you know that you can save money on your electric bill by using ceiling fans? It is an inexpensive way to save you approximately 10-15% on your electric bill each year. Ceiling fans range in price from around $100 to over $1000 depending upon the finish and style. Ceiling fans can be usually installed in just a few hours using the easy to follow instructions included with the fan or you can pay someone to install it for you. So give it a try and install ceiling fans all through your house!